This painting is inspired by the amazing images taken by NASA's New Horizons spacecraft during its historic flyby in the summer of 2015. It shows the close arrangement of the dwarf planet, Pluto with its largest moon, Charon. 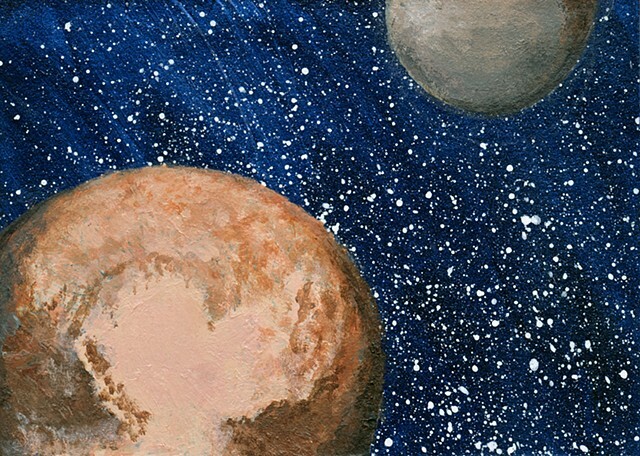 The painting highlights the well-known, heart-shaped region of Pluto known as Tombaugh Regio, named for Clyde Tombaugh, the astronomer who discovered Pluto in 1930. Prior images of Pluto were very blurry, so it's incredible to be able to view its awesome features now!